Byzantion in Thrace. Silver Siglos. ca. 416 to 357 BC. Size : 16.0 x 17.7 mm. Weight : 5.32 grams. Grade : gVF and well centred on a flan that is rounder than normal for the type. 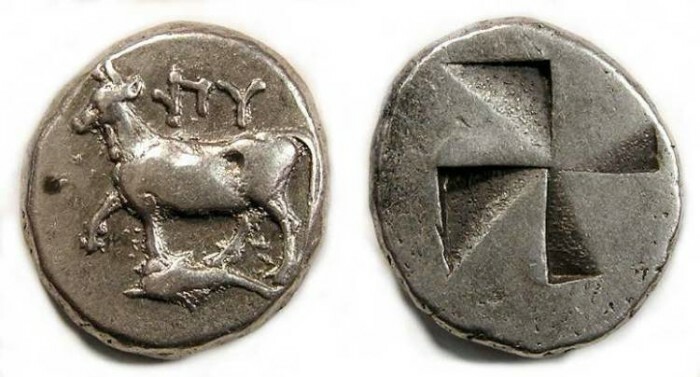 Obverse : Cow walking left on a dolphin, with BU above (but on the coin the B is in an archaic form that looks more like UG monogram). Reverse : Incuse mill-sail pattern, with pebbled surfaces inside the mill-sail.